Andrés Iniesta, the best player in Europe, plus the other members of the Barça party that went to Monaco, has come back from the UEFA Gala held in the Grimaldi Forum in Monaco. On board the flight to Barcelona were president Sandro Rosell, vice president Josep Maria Bartomeu and the director of football Andoni Zubizarreta, who held a toast in honour of the award. Back in El Prat, Iniesta and Messi once again spoke to the media and posed for photos with some of the fans that were waiting for them, after which the players departed to start thinking about Saturday, when the next training session has been scheduled. FC Barcelona and Schalke 04 have reached an agreement for the loan of Ibrahim Afellay to the German club until June 30, 2013. Ibrahim Afellay, 26 years of age, came to FC Barcelona on December 24, 2010 from PSV Eindhoven during the winter transfer window. He played 27 games, 16 in La Liga, 6 in the Copa del Rey and 5 in the Champions League. In the 2011/12 season, the highly versatile player was expected to play far more games than he actually did, given his ability to play in so many positions and shoot with both his left and right foot. But a serious cruciate ligament injury during preseason training meant he missed out on the entire campaign. He was finally declared fit in April 2012, but barely featured in the final games of the season. This summer he has appeared in all of the preseason matches and scored one of the goals in a 2-0 win over Dinamo Bucharest. The team will have Tuesday off and return to training on Wednesday afternoon, at 19.00. The closed-door session at the Ciutat Esportiva will serve to prepare the team for the away leg of the Spanish Supercup against Real Madrid (Thursday, 22.30). Tito Vilanova will hold a post-training press conference. The 47th edition of the Joan Gamper Trophy was won by Genovese outfit Sampdoria against a Barça side containing a large number of reserves. In extremely hot conditions, Barça dominated for most of the 90 minutes, but failed to find a response to the Italian club’s early opener. Sampdoria thus gained belated revenge for their defeat, twenty years earlier, in the historic final at Wembley. With an unusual starting eleven lacking any of the players that had beaten Real Sociedad just 24 hours earlier, Barça were stunned by a Soriano header in the very first move of the match. Not that that changed the home team’s system, led by Sergi Roberto in a man of the match winning performance, with passes from him and Espinosa producing the perfect service to strikers Villa, Afellay and Deulofeu. Where Barça were lacking was in the final metres. Almost all of the play was in the Italian half, but Sampdoria were happy to sit back and soak up the pressure while looking for chances on the counter attack. The visitors came close to extending their lead, but Maxi López’s goal was disallowed for offside and in the 35th minute, the former Barça man was again denied, this time by a truly tremendous save from Pinto. At the other end, Sergi Roberto came close to heading home a cross, Afellay almost found the net as well, and there were also a couple of opportunities for Deulofeu, but Barça were still trailing by the solitary goal at the break. Tito Vilanova made no changes during the interval. The action had barely restarted when Deulofeu came close to converting a Roberto assist, but visiting goalkeeper Romero did well. Barça spent almost the entire second half hovering around the Sampdoria area, but clearly lacking playing rhythm and also affected by the stifling heat, the chances were few and far between and most of the action was in the terraces, where the adverse scoreline didn’t seem to be having any effect on the enthusiasm among the spectators. Pozzi almost sentenced the match in a one on one with Pinto, but his 65th minute effort struck the post. Shortly after, Villa was calling for a penalty in his final intervention before being substituted by Román. That meant that the only first team squad members left on the field were Montoya, Bartra, Dos Santos and Afellay, the latter serving as captain. But no matter how much the Catalans tried, the Italians were able to deal with everything thanks to some admirably officious defending. 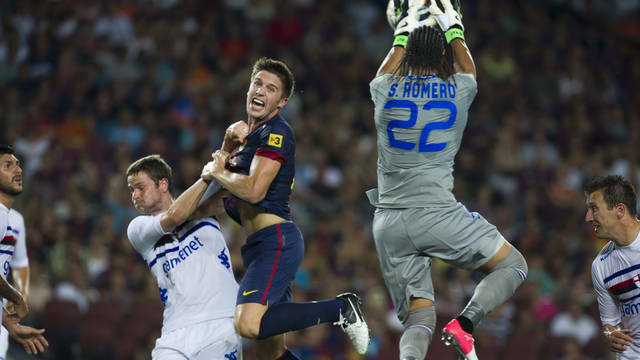 It ended 1-0, and the Gamper Trophy is off to Genoa. Alex Song had a nearly perfect presentation this Monday evening at the Camp Nou. Prior to this evening’s match, the player signed a five-year contract and posed for the traditional photo-op with the FC Barcelona crest. When the Cameroon international made his way out onto the pitch this evening the Camp Nou faithful responded with a prolonged and ruckus standing ovation. The party started at 21.20. Thousands of camera flashes illuminated the Camp Nou as the steward turned the lights off. Musical bands did their part to get the fans in a festive mood before the Dream Team made their way out onto the stadium’s pitch. Koeman, Stoichkov, Zubizarreta and co. made way for Piqué, Messi, Valdés and the rest of the still active FC Barcelona players. Tito Vilanova’s players came out according to their shirt numbers. The noise in the Camp Nou was nearly deafening when Abidal, Messi, Villa and Puyol’s names were called.